GoogHelper for Windows Mobile Smartphone is a stand-alone utility application that can be mapped to any external buttons on the smartphone, or added as in icon to the Today screen utilities to quickly launch various Internet searches using mobile friendly sites such as Google, Yahoo!Finance, Amazon, Wikipedia and much more, just just a single tap or single press. GoogHelper enhances search productivity with features such as ability to search the Web, Images, Gmail, Shop, News, Stocks, Maps, Groups, Software, Mobile, Books, and Wikipedia, with search results opened and displayed on default web browser i.e. Pocket IE. 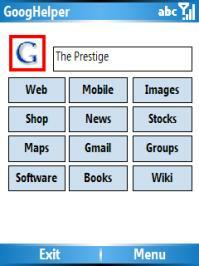 GoogHelper also can launch the web browser without doing a search with users simply tap the appropriate category button while leaving the search field blank.